While information technology continues to advance at a pace that few can keep up with, luckily for hoteliers, hospitality technology isn’t far behind. Over the last decade, the hospitality sector has witnessed a large number of PMS, Channel Managers, web booking engines, guest feedback systems and other software products inundate the market with new features. Many hotel owners ensured that their hotels are up-to-date to take advantage of the latest technology and implemented these stand-alone software tools. For a hotel, a property management system integrated with a channel manager and web booking engine is a necessity to seamlessly manage the hotel operations and room inventory distribution. Rather than employing various disparate systems to accomplish multiple tasks, hoteliers should always seek out as few systems as possible that are integrated tightly. Many hotels have various disparate software applications installed at different points in time in various functional areas, resulting in inefficiencies and integration challenges. Hoteliers are known to be visually-oriented people. For as long as we can remember, they have selected hotel management software based largely on the look and feel of the product itself. This makes sense. After all, the hotel staff never has quite enough time for a thorough training. Plus they have to jump from task to task based on the whims of the guests. 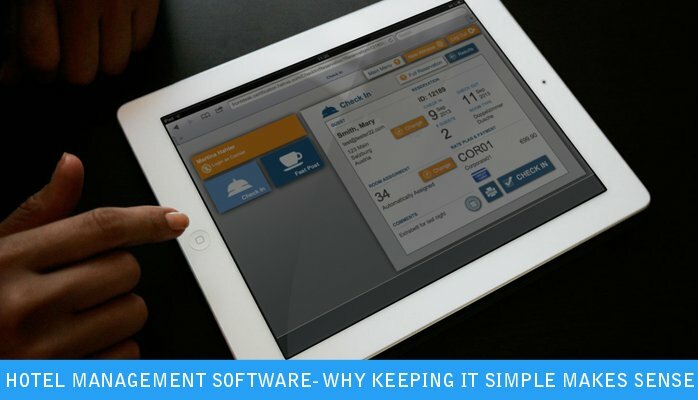 So any software they use must be intuitive, fast and easy. In short, hotel software needs to have an excellent user interface. When your hotel’s software systems are not synchronized, you have multiple overlapping databases, reports and dashboards and it’s not easy to get a view of business performance within a single time frame. Reports showing performance across your operations, online distribution, marketing, service, and offline bookings are crucial to give you an integrated view of your hotel’s operations. Most hotels do not venture out to gather this information regularly because of the sheer amount of time involved in the process. Hence, the decision-making process is either slow as the hotels depend on inaccurate information or in order to save time they take rash decisions completely based on instinct. Choose a hotel management system which allows you to integrate all functions of your hotel business and displays all reports in a centralized dashboard. Through a consolidated hotel software, channel manager and web booking engine combo, your online room inventory is updated and distributed in real time basis to diminish double/over bookings to a great extent. These days OTAs offer free cancellations and amendments, so guests can cancel/amend their reservations at any given time. If a hotel is operating on systems from different vendors, these amendments/ cancellations create a lot of uncertainty. Many a time, when such amendments are not recorded in PMS from OTA or Channel Manager, this leads to a frustrated guest who when they arrive at the hotel, realize that front office has no information about their booking. Sometimes, hotels receive bookings from OTAs, and later guests get in touch with the hotel and amend the booking as well which is reflected in the PMS but if you have different distribution vendor, there is a great possibility that your distribution software will not have any information on these amendments. So further if anything changes from OTA side, it creates anarchy. Thus, the best way to manage these issues is to have integrated hotel management systems to ensure that data is synced across systems. Key pillar to hotel’s success is Guest Satisfaction with fierce competition, it is essential that hotels provide an exceptional guest experience or risk having guests take their business elsewhere. When the hotel staff has access to better systems, they are able to devote more time to welcome and delight guests. Where all these problems are arising, it’s better to use hotel management software for your business instead of spending time to train for multiple systems is difficult for the hotel staff and they often find it difficult. Training for an integrated hotel management system is not just easy, it’s just good business. Employing the latest marketing trends by yourself, you can utilize simple software that does much of the work for you. Customer relationship software and general business management software eliminate the need for you and your staff to perform a variety of time-consuming functions. So with a new generation of mobile hardware now commonplace in hotels, hotel technology vendors are challenged to keep pace with today’s expectations of a top user interface.